Owned by Canterbury Oast Trust, this beautiful ancient semi-natural woodland is a nature reserve managed through a work experience programme for adults with learning difficulties. 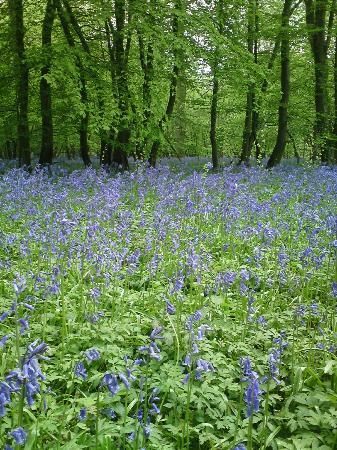 Poulton Wood is a working woodland so take a walk round the woodland trails and receive a warm welcome from the team of Rangers as they coppice and work the wood gathered from the reserve. The spring flowers are fabulous, particularly the Bluebells. Look out for the sculptures in the wood. There is an on-site shop which sells seasonal produce, locally sourced logs and kindling. Poulton Woodworks can undertake commissions for specific items such as tables, benches, fencing and arbours. The unique sustainable buildings include a straw bale classroom, a roundhouse mess hut and timber framed kitchen. Poulton Woods’s motto is ‘Working with nature in a spirit of friendship’. They provide real opportunities for adults with learning disabilities to train in a traditional craft. From Aldington, turn down Forge Hill. The entrance is on the right about half way down the hill, signposted Poulton Woodworks. Route no. 125 from Ashford passes through Aldington village.